I flip out over food recalls--last time it was peanut butter. This time it's the incredible, edible egg, the protein-packed powerhouse that's a staple in many athletes' diets (not so much my own until recently), wreaking havoc with a breakout of salmonella. At first I wasn't concerned because I'm guilty of buying eggs to then sit past expiration in the fridge, but the FDA warning I read scared me into submission. Not only did the recall affect Midwest states including my own, but my current carton falls on the brand list and in the expiration date range. Uh oh, I hope that's not why I've been feeling funky this week. The FDA lists the products in danger in this release and states that Wright County Egg of Galt, Iowa, where the contaminated eggs come from are voluntarily recalling its bad eggs. You don't have to worry if you're buying eggs whose carton labels differ from these, or if your eggs don't come from distribution centers in California, Colorado, Illinois, Minnesota, Missouri, Wisconsin, Nebraska and Iowa. Yet, if you're unsure about your egg purchase harming your health, contact eggsafety.org. So what do you do if the whites, yolks or a combo are your go-to breakfast or mid-day snack? Fortunately there are still other ways to enjoy those eggs and their benefits. Phil's Fresh Eggs. Based out of Forreston, Ill., you'll find these cage-free, better-tasting (they claim) eggs on Midwest store shelves. Whole Foods and Trader Joe's. Try the cage-free variety available on these stores' shelves in the dairy section. Farmers market fresh. I don't know if all local farmers markets have egg vendors but I could have sworn I've seen on at Saturday's Division Street market or the Green City Market. You'll be getting your eggs straight from the source, almost as good as having a hen in your backyard. Liquid eggs. Appealing: no shells to crack. Unappealing: pouring concentrated egg from a carton. But if need the protein source, these different brands won't make your omelet taste any different. Or at least my tastebuds haven't noticed. Tofu. Not an egg at all, but this protein-packer can embody the consistency of scrambled eggs (thanks Amy's for showing me that trick with your Tofu Scramble). Add some seasoning, maybe some hot sauce or cheese, and some veggies, and you're set. Thank goodness the egg recall isn't a nation wide epidemic and a few switches to the shopping list can keep them in my meal arsenal. I've just become accustomed to scrambling them with manchego cheese to recover after Yoga Sculpt, or customizing my Trader Joe's veggie fried rice. My body likes it too. Eggs have so many good-for-you benefits: amino acids, choline, healthy fats, protein. And especially at breakfast. Check out this list to read more. 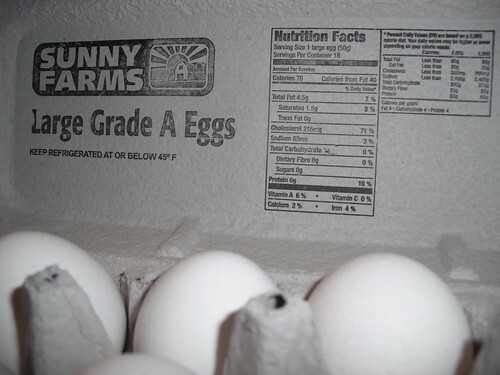 Those eggs are pretty incredible all right...as long as they're salmonella free. Photo grabbed from chelsey.baldock at flickr.